Prices start at $699 delivered depending on delivery location. $58 each while supplies last. Can be shipped for an additional fee. 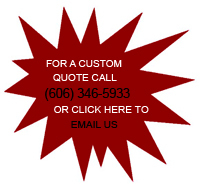 Call or email for quote. 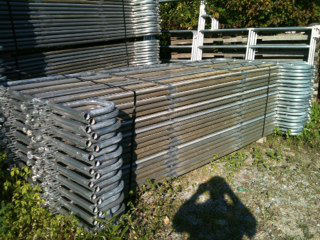 Galvanized finish ensures corral panels have extra life in the field. Ideal for light confinement, but strong. 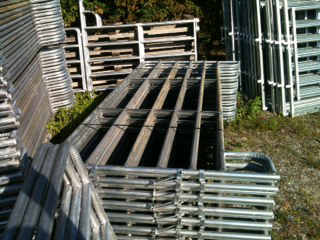 These corral panels are ideal for overnight shows and trail rides. Designed for the toughest situations, these corral panels are great for bison, bulls, or any other large animal you need corralled. The heavieset corral panel we offer is great for crowding areas, extra tall for working areas, feedlots, round pens, arenas, paddocks, and stalls. 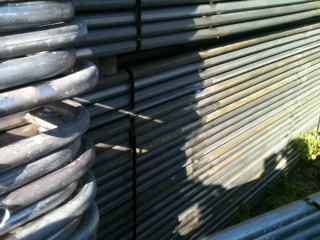 Round pens are available with the above corral panels and range from 30' to 80' feet in diameter. All painted corral panels have baked-on high solid paint that ensures a longer field life. Designed for the toughest situations, these corral panels are great for bison, bulls, or any other large animal. These corral panels are designed for containment in crowding areas such as feedlots and working pens. With horse and rider safety in mind, the exterior single-side pipe bracing provides a continuous and smooth interior corral panel surface. © Copyright 2002 - 2008, All Rights Reserved.